All subjects arrested or released from the jail. All transports such as Iowa Medical Corrections Classification (IMCC), medical, and out-of-county. 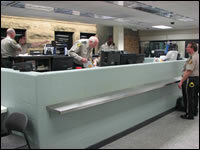 All paperwork such as court, transport orders, inmate file updates, and detainers. All inmate appearances for court or anything else. Inmate support service slips requesting property to go up or to be placed in their property. All phone calls from the public, law enforcement, Clerk's Office, Attorney's Office, and other county or state institutions. Booking is an busy place. Due to the heavy volume of work, many officers (Identification, Court Runner, Visitation Control Officer, Transport Officers, Supervisors) are utilized to assist in the booking process. This causes a demand on the other areas of operation of the jail. Consequently, as a result of the volume work, non-uniformed personnel officers and supervisory staff are required to work together as a team to support many tasks assigned in the function. Officers assigned to booking must be flexible and able to be proficient in all the functions of this area. In an ideal workplace at least two booking officers are needed for all the services that are completed on a daily basis.